I decided to clean out my pantry this month which meant all those hidden boxes of spaghetti, 10 different kinds of noodles, a few stray packets of ladyfingers had to be either consumed or I would either donate them or toss them out. This year I have been focusing on being a minimalist. Those who know me will know how difficult that is for me. I am the one who orders multiple dishes in a restaurant because I ‘think’ I am ravenously hungry or I cook a lot more than necessary when I have friends over lest we fall short. So overdoing it has always been a problem. So here we were, wondering what to make out of it. 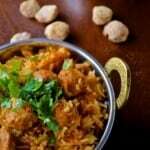 Biryani is what came to my mind and since I had a good Shrimp Biryani recipe, I decided to follow the recipe. We were delighted at the outcome and have decided that this recipe of Soya Chunks Biryani is a keeper. By the way, Soya chunks match the protein content of meat and are considered a meat extender. While they are super easy to make, here’s something you need to remember – Soya chunks need to be repeatedly rinsed at least 3-4 times after being boiled otherwise you will find your dish ruined because the Soya chunks were tasting weird. Boil 3 cups of water in a saucepan and add a pinch of salt. Add soya chunks to the boiled water. The soya chunks should be completely immersed in the water. Let them cook for 6-8 minutes. Let the soya chunks cool for 4-5 minutes and gently squeeze the water out of them. Rinse the soya chunks in cold water and squeeze the water out of the soya chunks. Repeat this process at least 2 more times. Cook the rice with twice the amount of water and salt (1/4 tsp) till it is 3/4th done. [ Note: I make my rice in the microwave. Normally I keep it for 16 minutes but when I am making rice for pulao I keep it for 12 minutes]. Set aside. In a medium-sized kadhai or wok add 3 tablespoons of oil and keep it on medium heat. Add peppers, cloves and bay leaves. When they sizzle (after 10-15 seconds) add onions and garlic. Fry them till the onions turn translucent. Add tomatoes and continue frying till they turn mushy. Add the green chilies, red chili powder, salt, turmeric powder, and soya chunks and mix well. Whisk the yogurt well and mix it with the coconut milk (if you are using it) and add it to the kadhai/wok. Continue to keep it on medium heat for another 8-10 minutes. At this point, the gravy should run thick and the soya chunks should have absorbed the flavor from the gravy. Add garam masala or biryani masala and mix well . Add the rice to the kadhai and carefully fold it in and simmer it for 5 minutes covering the kadhai before taking it off heat. Garnish it with coriander leaves and serve hot with raita. 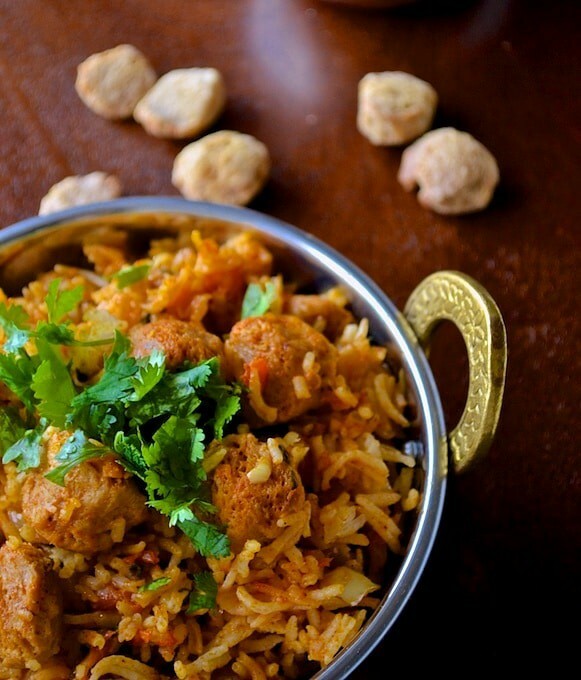 Thank you for this simple and tasty biryani recipe. Glad you liked it, Asha!